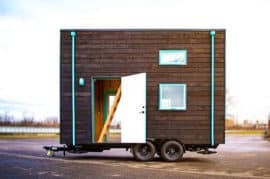 I’m excited to let you know about two new tiny house plans released recently by Portland Alternative Dwellings and tiny house builders, Shertlerwise. The Bunk Box Tiny House Plans – On Sale Until Tuesday, Nov 1! 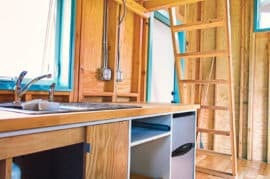 The Bunk Box Tiny House from Shelter Wise is a unique and modern design that leaves the wall framing and electrical exposed on the interior. This creates an extra seven inches of interior space that residents can use, see, and feel. 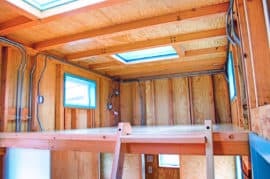 With a flat roof and exposed ceiling framing, the loft offers extra height and increased functional space. Two skylights, six windows, and an optional second door bring the outside in and increase the feeling of spaciousness. 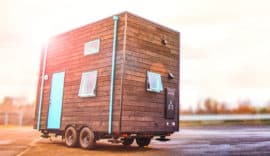 Although it’s built on a 16 foot trailer, the Bunk Box lives as big as a 20 foot house. Get the plans for $69 until Tuesday, November 1. Regular price of $99 begins Wednesday, November 2! This unique design offers a ton of construction details to learn from. Whether you’re a current builder or aspiring DIYer, you’re going to want these on your shelf! Many of you probably know the amazing Dee Williams (mother of the modern tiny house movement). She’s recently made plans available for her original Kozy Kabin tiny house. Dee designed her Kozy Kabin in 2004 after buying a set of plans from Jay Shafer of Four Lights Houses. The space was inspired by seeing Jay’s house and hanging out with him in it. 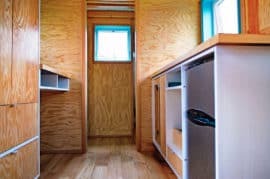 Dee re-engineered the design with a slightly different trailer set-up and a completely different floor plan – one that was even more simple, comfortable, and basic. 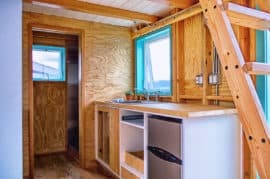 The 84 square foot Kozy Kabin Tiny House has no running water, no exclusive bathroom space, and just a smidgen of solar electric power. ← New Option for Tiny House Insurance!